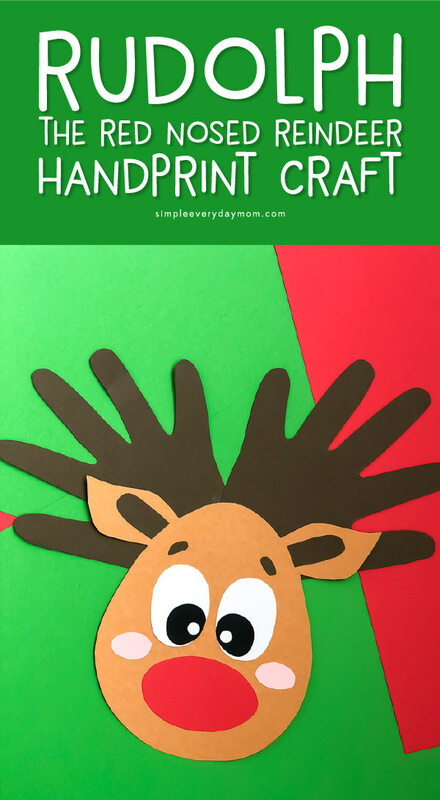 Inside: This Christmas, make this adorable handprint reindeer craft with the kids. Christmastime is nearly here and we’re ready to celebrate with tons of fun activities for kids! Over the last few years, we’ve shared some of our favorite Christmas stories for kids, played with these Christmas tangram mats, used these Christmas activities for kids to celebrate all month long and even shared these editable letters from Santa. 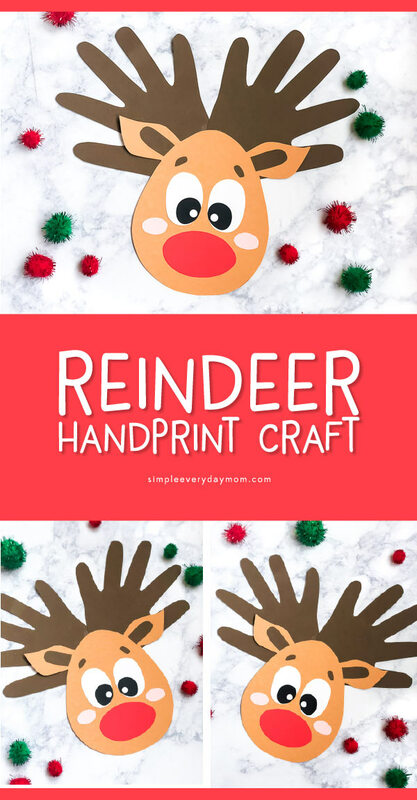 Today we’re sharing this easy and cute handprint Rudolph craft your kids will love to make. Read on below to see how easy it is to make this craft with your family. Handprint crafts are some of our favorite crafts to make at our house. 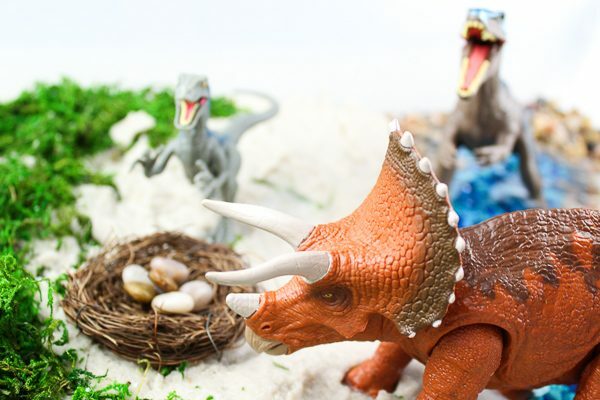 Recently, we’ve done this fish handprint craft, this fall handprint tree craft, this dinosaur handprint art, and this handprint bear craft to name a few. 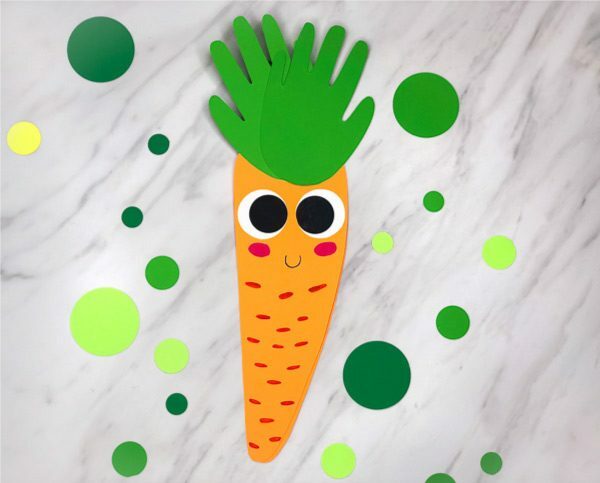 Kids love to see their hands magically transform into a cool new art project and parents love to have a way to preserve those little handprints for the future! This Christmas handprint craft is great because it doesn’t use paint so you don’t have to worry about making a mess. It’s also nice for all age kids since you can prep all the pieces ahead of time. 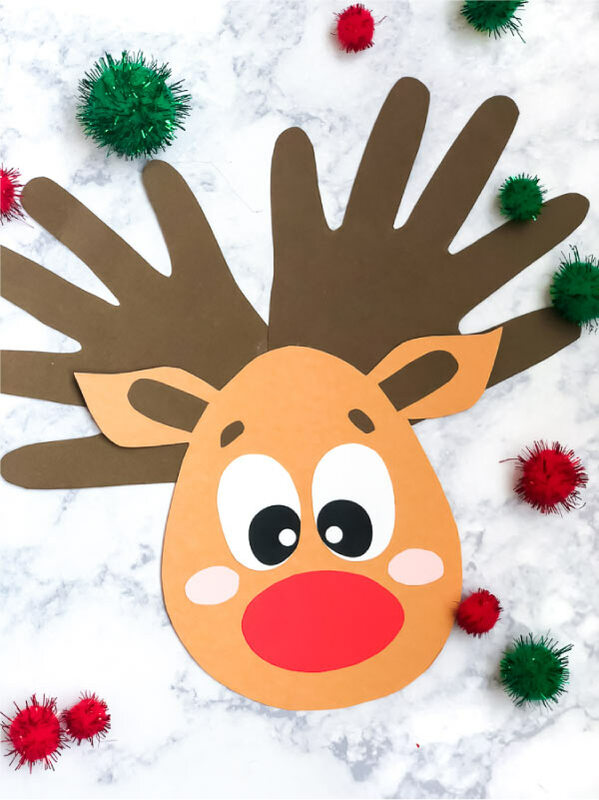 Print out reindeer template on white cardstock and cut out all the pieces. Trace each template piece onto the correct colored paper and cut out. 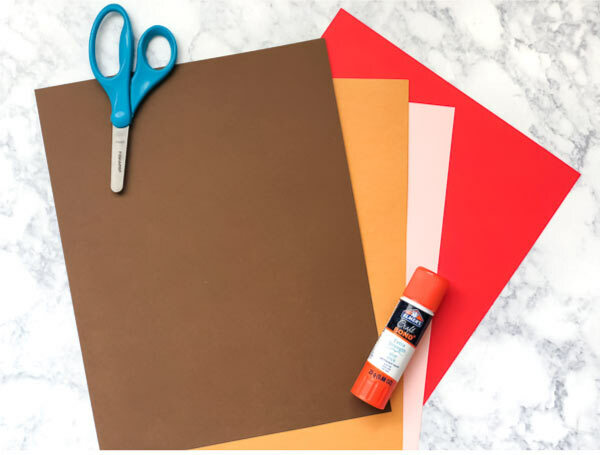 Trace your child’s hand onto the dark brown paper and cut out. 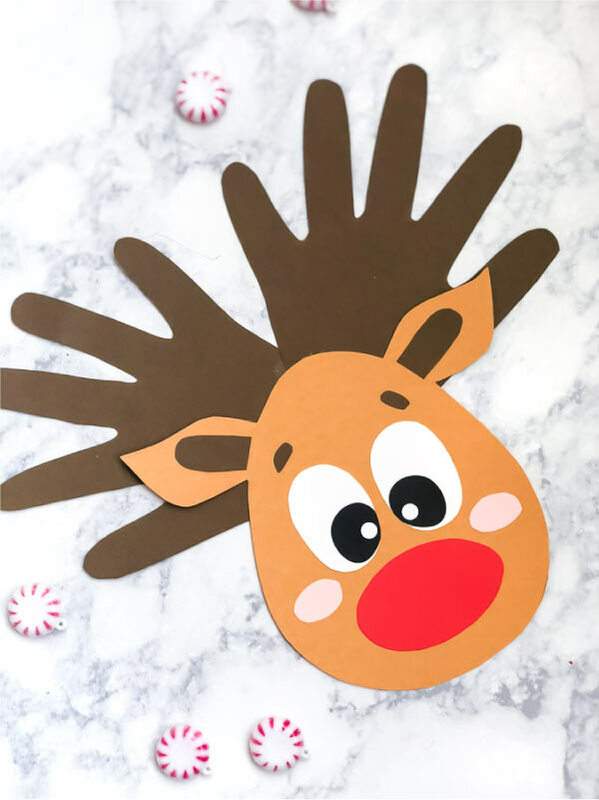 Glue each of these pieces onto the reindeer face as shown in the picture. Glue the handprint antlers behind the head. This is such a fun handprint craft for kids and it’s easy to adapt it for kids of all ages. Older kids can do it this craft all by themselves once you explain the directions or show them the completed project. 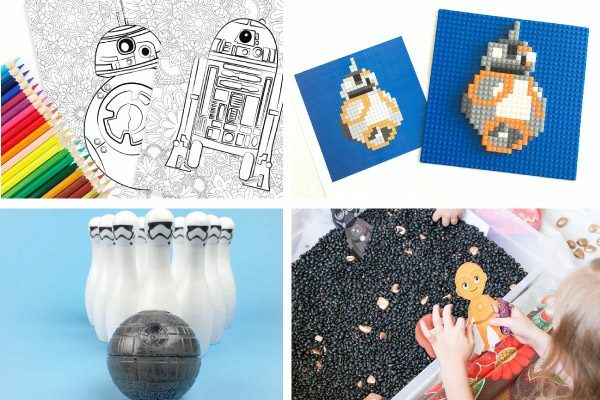 You can help young kids do this craft by having all the pieces pre-cut and ready to glue together. To add a little more, you can also draw on a smile with a marker under Rudolph’s nose. Don’t forget to enter your email in the form below to have the reindeer template link emailed directly to you. So glad! I hope you guys have fun!! For some reason, I am not getting the download for the hand print reindeer. Can you help. I would love to have it to make reindeer with the little ones while others shop. Thank you for the kind words!! Hope you have fun making them! Hmm, that’s strange. Can you email me directly at [email protected]? That way I can make sure it gets sent to your email. I love this idea! Where do I submit my email for the template download? I’m not seeing the form. All that there is a place to leave comments. Maybe I’m missing something? I hope it is for you guys! cant wait to use this for our memory books!!! great craft, thank you! I would love to do this reindeer project with my students. How adorable! Thank you and Happy Holidays.